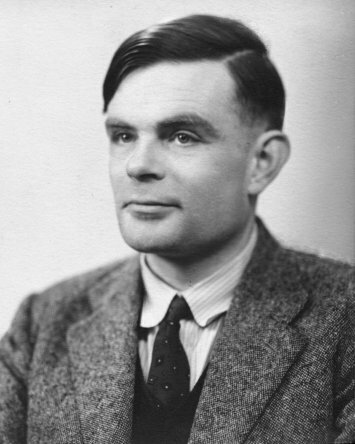 The Turing Test was first concocted in the early 1950s by computer theorist and visionary Alan Turing. The test was designed to answer the question “Can computers think?” In one version, an inquisitor sits before a panel and asks questions into a console. Two sets of answers are projected back to him on a screen, one from a real live human being, the other from a computer. The test is designed to fool the inquisitor as to which is the real human being. At a certain point, computers will become so intelligent that there will be no possible way to distinguish between man and machine. What Turing didn’t explore was the other side of the coin. Instead of revealing what it means to be a computer, the test actually reveals what it means to be a human. Enter Ken Jennings, a good-humored human with a mind for trivia. Beginning in 2004, Jennings appeared on the TV show “Jeopardy” over 70 times, winning several million dollars in the process and dazzling us for knowing everything from ancient history to pop music to minor Civil War battles. 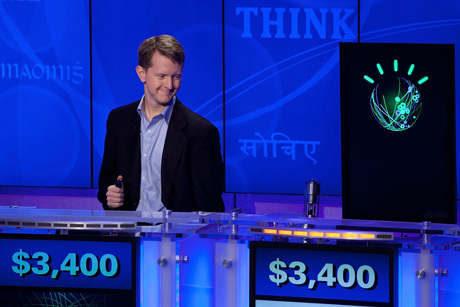 In 2011, IBM and Jeopardy invited Jennings back to the game show to play some exhibition games against a new “super” computer named Watson. Watson can’t think, it wouldn’t be able to tell you what color tie you are wearing, it wouldn’t be able to point to a chair in a photograph. But the machine was programed to make associations between words in trivia questions and attempt to extrapolate answers. If it reached a certain level of certainty, Watson would chime in and give its answer. And it performed well. Really well. It was fast. It was well informed. And most of all, it didn’t get nervous. It wasn’t aware it was playing a pick-up game for the future. The beginning of the next existential crisis faced by people: What happens when our machines best us at thinking, the last thing only humans could do? This little Turing Test helped us answer a lot of questions about computers and our minds and what it means to think. But the noble test forgets one thing. Computers are practicing being human, Ken Jennings already knows how to be human. It’s innate within him. During the final moments of the final game of Jeopardy between man and machine, when Jennings had a little over 18-thousand dollars and was in a good position to lose, Ken’s answer was revealed. It was correct: Bram Stoker, the 19th century novelist. Watson also got the correct answer, but it had more money. It outbid Jennings in Final Jeopardy and won. Or did it? Ken had scrawled a humble little message under his answer, sort of like thumbing your nose, creating humorous commentary, and paying respects all at the same time. “I, for one, welcome our new computer overlords” was Ken’s message. He laughed. The game show audience laughed. The world laughed. Watson did not laugh. It did not even blink one chip in it’s little circuit board brain. It could not if it wanted to. That’s what truly separates man from machine. Machines are cold and calculating, not emotional and approachable like Jennings. Ken did humanity a service that day. He did something no one else wanted to do. Go up against one of the most powerful computers in the world, complete with an encyclopedia brain with nearly all the world’s trivial knowledge, accessible in a few nanoseconds, and lose in front of the entire world. Humanity’s sacrificial lamb. I think this version of Turing test did not prove machines think. Machines can only access information at light speed. They are better than humans at fact retrieval and number crunching, but they will never think like humans. If the battle between man and machines is coming, I’m glad we have people like Ken Jennings on our side, even if people end up vanquished. I, for one, welcome our new fleshy compatriots, who can lose with grace, dignity, and style, and still advance the meaning of being human. This entry was posted in Futurism and the Tomorrow Mill, Pop Culture: Movies, Art, and Comics, Technology and tagged Artificial Intelligence, Jeopardy, Ken Jennings, robot revolution, technology, Turing Test, Watson. Bookmark the permalink.